Can a Geek Love Xandros? With its many superb, user-friendly enhancements, Xandros Desktop has justly become known as one of the top products for Windows-to-Linux migration, suitable for any non-technical user. But how about the rest of us? Some of the more experienced among the readers can surely configure CUPS with Samba by editing configuration files with closed eyes. This kind of exercise is useful and fun the first few times, but it can quickly become a mundane task if it has to repeated often. Wouldn't it be nice if we had a distribution that could do it near-automatically? In other words, wouldn't it be nice if we just used Xandros? And despite our natural resistance to use GUI for any kind of configuration, could we still love Xandros? Robert Storey investigates. Debian is an industrial-strength distro known for its stability, superb package management, large software archive, a terrible installer, and a lot of powerful but esoteric commands such as: "dpkg-reconfigure etherconf, dpkg --get-selections, apt-get upgrade, grep-status emacs" and so on. There have been several commercial attempts to cloak Debian's mighty engine in a nice sleek-looking exterior. Xandros Desktop OS is one of the slickest attempts yet at putting a point-and-click interface on the untamed beast - think of it as Debian with pizazz. Xandros version 2.0 was released in December, 2003, and not surprisingly, a flood of reviews hit the web soon thereafter. Most of these reviews have focused on the ease-of-use factor, which is Xandros' trump card. Which creates a dilemma for reviewers like me. For the past few weeks I've been reading over and over about how Xandros has added so many Windows-like features ("root" is called "Administrator", the modem is on COM1 rather than ttyS0, and there is even a "drive C:"). I was starting to get bored even before I received my Xandros CDs in the mail (which took a long time given my remote location). One reviewer wrote that "geeks should look elsewhere" - as a certified geek, I found that depressing. So rather than simply repeat what has been said ad nauseum ("Xandros is so easy to use, just like Windows - Wow!") I've decided to take a different approach. I'm going to throw everything I can at Xandros, including "not recommended" things that could possibly break it. That means installing Debian Unstable packages, running it as a server, stripping off the graphical bootup system, even running a different window manager than KDE, and so on. "Geeks should look elsewhere" - hah! Damn the "kernel panic" messages, full speed ahead. I realize that this is unconventional, but hey, it's my computer and my review, and I don't have anything better to do this weekend, so why not? Back when dinosaurs roamed the earth and everybody thought that 64 Kbytes of RAM was a lot, a small upstart Canadian company named Corel was founded. The year was 1985 - Microsoft Windows 1.0 had just been released (and was roundly criticized for being slow and unstable). Nobody at the time thought of Windows as an operating system - it was just one of several GUIs for MS-DOS. Even Microsoft was saying that the next great OS would be OS/2, or maybe Microsoft's Unix clone, Xenix. A lot of water has passed under the bridge since then. Xenix evaporated long ago, though Microsoft still uses it as an excuse to subsidize SCO. Corel released the widely acclaimed CorelDRAW in 1989, and with its growing mountain of cash acquired other software powerhouses including WordPerfect, Ventura Publisher and Micrografx. Corel Linux was released in 1999, back-to-back with Corel WordPerfect (the best Linux word processor at the time). Again and again, Corel won plaudits for its software innovation. Corel Linux got a lot of people excited when it first hit the streets. For one thing, the graphical installer was a breeze to use, and the desktop (based on KDE 1.1) was also finely tuned (at least by the standards of 1999). Corel WordPerfect for Linux was also included with the distro, giving Windows refugees a familiar word processing interface to work with. Virtually all of the Linux-aware computer magazines said that Corel Linux was the most user-friendly distribution on the market. Pundits confidently predicted that Corel was a company that was poised to give Microsoft some real competition in the OS market. Unfortunately, that's what they said about Netscape too, and things didn't work out as planned. Corel Linux hit the shelves just as the dotcom bubble burst - the timing could not have been worse. By October 2000, a financially troubled Corel announced that it was selling 24 million shares to Microsoft for US$135 million. Corel Linux silently went the way of the buggy whip. In 2003 Microsoft dumped its stake in Corel, taking a reported US$100 million loss (though some tend to think that it was money well spent). So Corel Linux was a distro with a great future behind it, right? Well, not exactly. A lot of good technology had gone into the project (not to mention money), and it would have been a shame to see it all wasted. Fortunately, Corel found a small Canadian upstart named Xandros that was willing to buy their OS for US$2 million. And that's where our review really begins. Possibly you will find Xandros on the shelf at your local computer store, but most people will probably go to www.xandros.com and order it online. The web site also includes a list of resellers, and even a few companies who will happily sell you a whole PC with Xandros pre-installed. Xandros Desktop OS 2.0 is currently available in two versions, "Standard" (US$39.95) and "Deluxe" (US$89). The main difference between the two is that Deluxe includes a fully-integrated copy of Codeweaver's CrossOver Office (US$69.95 if bought separately) and CrossOver Plugin (US$39.95). CrossOver Office allows you to run designated Windows apps under Linux, including Microsoft Office XP, Lotus Notes, Macromedia Dreamweaver MX and Intuit's Quicken, among others. CrossOver Plugin supports such play-things as Apple's QuickTime, Macromedia Flash, Real Player, Shockwave and Windows Media Player. So if you need these functions, it may well be worth the extra $50 for Xandros Deluxe. A Business edition is also in the pipeline. Among its announced features are several commercial applications including StarOffice, Citrix client software, and a SAP client. Other anticipated features are IBM terminal emulation, Windows PDC authentication and Windows Active Directory server authentication. Installation tech support (via Email) will be extended to 90 days (for Standard/Deluxe it's 30/60 days respectively), but in my opinion if you can't manage to get Xandros installed and working properly after 30 days, you might as well give up. There is no word yet on pricing for the Business edition. Xandros comes in a colorful professional-looking boxed set. The Deluxe version includes a printed 318-page User Guide, though it's very much geared towards beginners and could hardly be thought of as a Geek Reference Manual. It should be noted that Xandros can be purchased as a downloaded *ISO file. That will save you some time getting the goods into your hot little hands, but it should also be noted that the downloaded edition is not priced any cheaper than the boxed set. The only monetary saving of the downloaded set is that you won't have to pay shipping. There is not a whole lot to say about the installation except that Aunt Tilly could do it with her eyes closed (unless she's dead). Xandros boasts superb hardware detection, so unless you've accidentally mistaken a Macintosh for a PC, the install procedure should go smoothly. The first and most important decision you need to make is whether you want an "Express Install" or a "Custom Install". Choosing "Express Install" runs the risk that Xandros will overwrite existing partitions (and the included data), but it will warn you of this before proceeding. "Custom Install" is certainly more interesting, not only because you can select the partition where Xandros will reside, but also which software packages to install. By default, almost everything is selected for installation with the notable exceptions of Apache and FTP Server. And of course, any geek worthy of the title will want to install server software. I chose to install everything except Novell Netware. After clicking the requisite OKs, there was little more for me to do for the next 10 minutes but to go make a cup of caffeine. At some point in the process, there were a few mundane questions about the root and user passwords, setting up a printer and such, but there is no reason to go into all that. A veteran of previous Linux installs should find the whole procedure boring at worst. When the installer finishes its job, you are prompted to remove the CD, and are then delivered to a KDE desktop. However, Xandros has performed plastic surgery on KDE, giving it a somewhat different look & feel from what you may be used to. Nevertheless, it's not bad at all, and certainly delivers on the promise to put a user-friendly exterior on Linux. Although the installation procedure didn't tax my brain too hard, it did produce a few notable hiccups that required further investigation. Most importantly, I couldn't help but notice that I was never prompted to insert the second CD (the one labeled "Applications"). The second CD comes only with the Deluxe version, but it's still rather rather peculiar that the installer ignores it because I did choose to install everything (but Novell). Furthermore, disk two does indeed have some rather useful goodies - it's not simply games games and other trivia. Most crucial for me is Emacs, the Swiss-army knife of editors that includes everything plus the kitchen sink. I use Emacs for just about everything, including psychoanalysis (do an "M-X doctor <enter>" and you'll see for yourself). 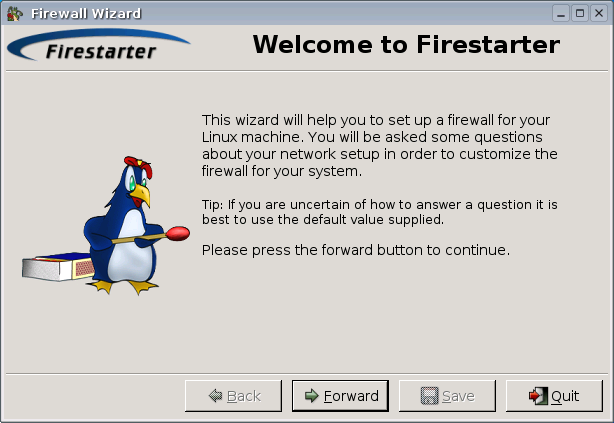 Perhaps even more crucial, Firestarter (the Xandros firewall) did not install. I find that peculiar, since one of the first things Xandros' wizards nag you to do is go online and register. But no one should go online without a firewall. So one of my first tasks was to install all the uninstalled treasures on disk 2. Being based on Debian, I thought that perhaps Xandros would make use of Synaptic, the Debian graphics utility for installing and uninstalling packages. However, Synaptic is nowhere to be found - rather, Xandros has deployed its own system called "Xandros Networks." It's a reasonably user-friendly system, though somebody coming straight from Windows XP might find it baffling at first. "Xandros Networks is having problems downloading data from the Internet." Yes, as the name implies, Xandros Networks looks to the Internet for its data. But I didn't want it to do that because I planned to retrieve files from my CDROM. The trick is to click on "Edit --> Set Application Sources" and then click on your CD drive. I also needed to click on "File --> Enter Administrator Mode" in order to get root privileges so I could install programs. After doing this, I could then explore the menu under "New Applications", where I could select apps I wanted to install. Sounds simple right? Well, it was, but there was a catch - some of the apps shown in the menus weren't actually on the CDROM, so they could not be installed. Even worse, some apps (including my beloved Emacs, as well as Firestarter) did not show up on the menus even though there were in fact present on the CDROM - this appears to be a bug. Still, the exercise was not in vane. I did successfully install several compilers (gcc, g++ and c++) plus other development tools, the sort of thing that every geek needs. But I still wanted Emacs and Firestarter. To get these, it was time to start working on the command line. That's fine by me, but it's just the sort of thing that would terrorize a fresh-faced newbie. Debian is famous for its APT (Advanced Package Tool) system of package management, and Xandros actually uses this (though it is hidden behind a point-and-click interface). So my first hacking adventure with Xandros involved getting the apt-get command to work so I could install packages from the command line. Firestarter installed without incident. Then, in order to actually configure the firewall, I had to log in as root and run the command "firestarter" from an Xterm. With Firestater installed and configured, I finally felt confident enough to go online and register my copy of Xandros, as well as do a little web surfing. I would have checked my Email, except that I wasn't comfortable using Mozilla Mail, which at this point was the only Email client installed. Surprisingly, Kmail is not included, though it can be downloaded from Xandros Networks. Although I intended to play rough with Xandros and even break things, one safety feature I always install out of habit are some aliases that prevent me from accidentally wiping out files at the command line. Some distros enable this by default, but Xandros (surprisingly for a newbie distro) is not one of them. I performed the above surgery for all my user accounts, including root. This is not to say that you absolutely must do this, but merely to suggest that it would be a damn good idea. You have to log out and log back in for the new settings to take effect. After this, when using the rm, cp, and mv commands you will be prompted if your action will erase/overwrite a file. The last setting (set -o noclobber) will prevent you from wiping a file with redirection (that funny ">" symbol). Now that I'd fastened my seatbelt, it was time to do some real damage. First off, I hate the cutesy graphical login that Windows-users love. I am used to booting up in text mode, and then starting Xwindows manually with the "startx" command. Xandros, by contrast, adheres to the philosophy that users should never see text mode under any circumstances. The graphical login is produced by starting a program called kdm (the KDE Display Manager). Xandros' programmers have tweaked kdm to add some extra features, and they have renamed their version kdm-nd. Bear in mind that some Xandros features will be disabled if you don't run kdm-nd. Most notably, kdm makes it possible for users to shut down the system with a point-and-click operation, so if you disable it you will need to become root and run the shutdown or halt command. Also, without kdm Windows authentication will also be disabled, though this will only affect users of the upcoming Business edition. So to boot into text mode, all you've got to do is remove the above-mentioned symbolic link and reboot, correct? Well yes, that works, but it might not leave you feeling satisfied. What you will find is that, first of all, you still won't get to see all the text messages scroll by during the boot process - they will be hidden by the Xandros splash screen. Secondly, when the splash screen disappears, you will probably (depending on your video card) find yourself with a totally black screen! Fortunately, if you tap on the <enter> screen four or five times, the totally black screen will vanish and present you with a proper text-mode login prompt. I spent quite a bit of time trying to see if I could eliminate this "black screen of death", but to no avail - it seems to be something compiled into the kernel. I suppose Xandros developers will say that this is not a bug, it's a feature, but it's a feature I could easily do without. Then run the command "lilo" and reboot. The fancy Xandros splash screen will be gone, but you will have a menu where you can choose which OS you want to boot. You will still wind up with a black screen of death which you get rid of by hitting <enter> a few times - then finally you can log in and run "startx". Again, you will have to log out and log back in again before the new alias takes effect. The other advantage of starting X manually is that different users could use different window managers (rather than KDE for everybody). Of course, you would first have to install these window managers, since only KDE comes with Xandros. Fortunately - with the exception of Gnome - most window managers are very fast and easy to install (either using apt-get or just compiling from source). As you might suspect, running a window manager other than KDE wipes out many of the user-friendly advantages of Xandros. That's all there is to it. You can always delete or rename file .xinitrc and propellerhead will be back to using KDE. Once you get online, you can use Xandros Networks to install additional programs as well as update them (and even to install a new kernel). But I was interested to see if I could use the standard Debian Unstable archives to do the same thing. On the plus side, Unstable has over 13,000 packages available (which is nearly every Linux program currently in existence), far more than Xandros Networks can offer. On the downside, mixing software from Unstable with a nice solid Xandros desktop could wreak havoc on your dependencies, leading to unpredictable behavior. But who cares? We come not to praise Xandros, but to break it. So onwards. Unfortunately, the Debian server has been down for several weeks. However, since I live in an area with a shakey Internet connection, I am prepared for such lapses - I have a full set of Debian Unstable on CDROM. It's an 11-CD set that I acquired about six months ago (which means it's also rather out of date, but it will do for our experiment). So I was all ready to start installing packages. I installed Sylpheed, my favorite email program. I installed Mailfilter, superb for filtering out spam, Windows viruses, and other detritus that I want to keep out of my inbox. I installed gqview and GTKsee, both of which are great for viewing graphics files. I added antiword for converting Word document files into ASCII; flip for converting Unix files to DOS text and back again; wordinspect (plus dict-gcide) so I'd have a reference dictionary at my fingertips; lynx for reading html files and converting them to ASCII text. Last but not least, I installed gftp for downloading and uploading files via ftp. Surprisingly, I had few problems. There were some packages that refused to install, but most were OK. I had anticipated that my installation of Xandros would be pulverized by dependency errors, but to my amazement it held up through the storm. Nevertheless, be forewarned that the above was a risky procedure. Remember the Debian guarantee - if it breaks, you get to keep both pieces. There is a running joke that you can install Xandros on a Windows user's hard drive, and he or she won't even notice. That, of course, is an exaggeration - surely our hypothetical Windows user would wonder what ever happened to Solitaire. Cynicism aside, Xandros Desktop 2.0 is not really Windows - it's KDE with some nice user-friendly tweaks. The Deluxe edition does give you the possibility to run real Windows programs if you need them. For people trying to gradually wean themselves off of Windows, this can be a very useful feature. If you happen to work for a company that is addicted to Windows apps, Xandros may well be the best available option. Xandros also deserves kudos for superb hardware detection. And I have no complaints about its stability - I experienced no crashes, not even when running Microsoft Office. Even my hacks didn't succeed in destroying the system, though I bet if I'd tried hard enough, I could have made a real mess. Still, my experience wasn't perfect, and I hope the Xandros programmers will take my suggestions for improvement seriously. In particular, it would be nice if choosing the option to install everything really installed everything (at least everything on disk 2). It wouldn't hurt to have a disk 3 as well - the included apps were rather lean, and not everyone feels like downloading (and not everyone has broadband). Before going online for the first time, it would make sense to have the firewall already installed and configured. And could something be done to get rid of the black screen of death (aside from repeatedly hitting the <enter> key)? The printed User Guide looks pretty, but it could use more meat and potatoes, rather than just the salad dressing. A suggestion (not only for Xandros) - include Loop-AES encryption. This allows you to encrypt partitions and files. Many free distros such as Knoppix have it built-in, even though the public is only dimly aware of it and it's not easy to use. As a devout paranoid, I'm a great believer in encryption and I'll have more to say about it in future articles. Certainly if you install valuable data on a laptop (which could be easily stolen), you'll want to consider the benefits of encryption. If Xandros could develop a nice user-friendly interface to put on top of Loop-AES, that would really be an innovation - under such circumstances I might even go out and buy a copy of Xandros myself. Obviously, for the geek community, there are many other options besides Xandros, many of them free (Debian, for example). Nevertheless, Xandros can be fun to hack. If you really want entertainment, try compiling the 2.6.0 kernel on it along with some patches. No guarantees on what will happen if you do that, but as Clint Eastwood once said in one of his movies, "If you want a guarantee, buy a toaster." Please visit this forum at OSNews if you wish to discuss the review. Formerly a well-known travel writer, Robert has spent half his life in Asia (and is still there). Long since overdosed on travel writing, he spends his spare time hacking and helping "repair" broken computers for free (by installing Linux). The review copy of Xandros Desktop 2.0 Deluxe was kindly supplied by Xandros Corporation. CodeWeaver's commercial product (based on Wine which is free). CrossOver Office allows one to run specified Windows apps, which CrossOver Plugin allows certain Windows plugins to work with your browser. The Deluxe version of Xandros includes the two CrossOver products. Xandros is based on Debian, and Debian's system for managing binary software packages is called APT. It includes the ability to install, uninstall, and resolve dependencies.